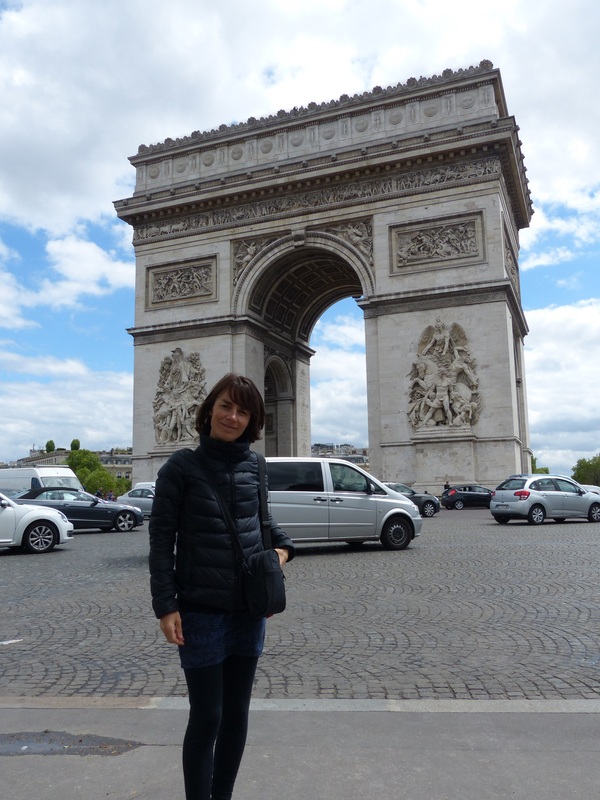 I Love Paris in the Springtime… – Run. Ride. Roam. …Except when the rain is pouring and the wind is blowing! I think they left those lines out of the song. Today was very much a roaming day, in fact about nine hours of solidly roaming the streets of Paris. Yes indeed the rain did pour and we got wet, yes the wind did howl and we got blown about, but it was a great day of just walking, walking, walking non-stop, seeing the famous sights of this wonderful city. The sun did make an appearance in the afternoon, which painted an even brighter picture for us. 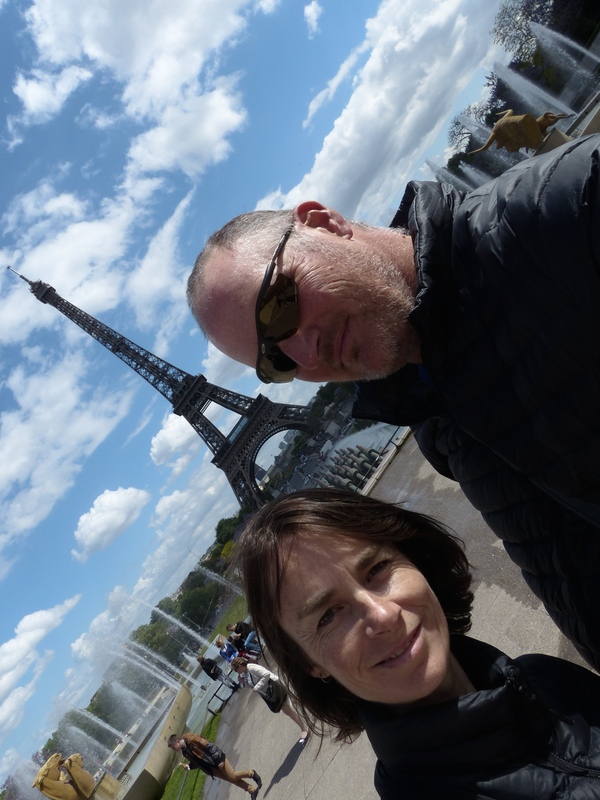 Paris is not quite what I was expecting…it’s a whole lot better. For some reason, I think from comments other people had made over the years, I was expecting it to be a bit grotty, a bit dowdy I suppose, but not at all, it’s an absolutely beautiful city. 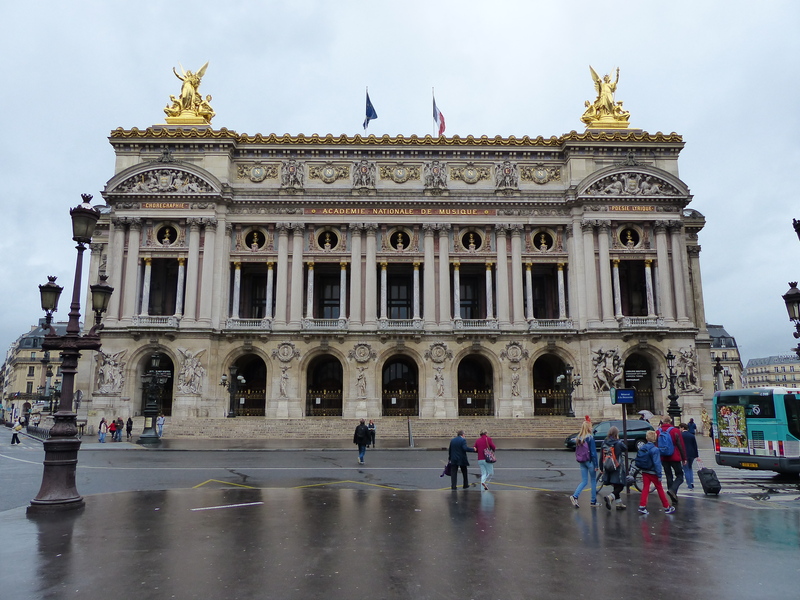 We caught the train in and exited the underground metro at the National Opera and just that was a beautiful introduction to the city, such a grand building, looking quite majestic against the grey sky. We stopped for a cuppa so we could consult our map, get our bearings and create some sort of roaming plan, then off we went and headed towards the Louvre. Apart from wanting to see the building, on a pretty miserable day such as it was, we thought what better place to seek refuge from the weather, while also spending time seeing what was housed within this famous place. 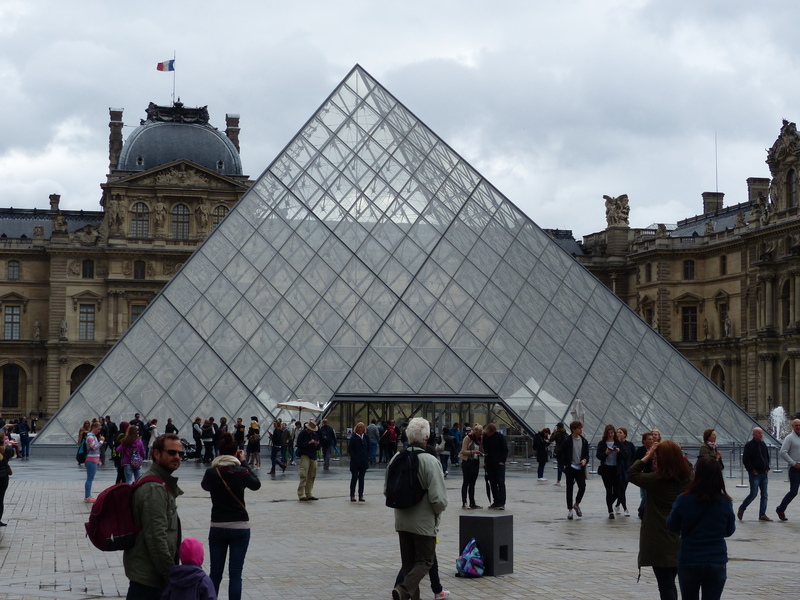 As we approached, at top speed, bundled along by a powerful tail wind on our heels that propelled us towards the unmistakable and unmissable glass pyramid sitting centre stage to the Louvre’s historic and beautiful facade, we came upon a sign. Now what do you suppose it said to us on this blustery Tuesday morning? We have encountered its message previously on roaming days when we have been intent on seeing the sights. What did it say?…CLOSED ON TUESDAYS! Wouldn’t you know it! The buildings though, were once again just magnificent and stunningly beautiful. I did think the glass pyramid was a bit of a blot on the landscape in amongst all the beautiful old buildings so I could understand the outcry it provoked when it was first erected there. 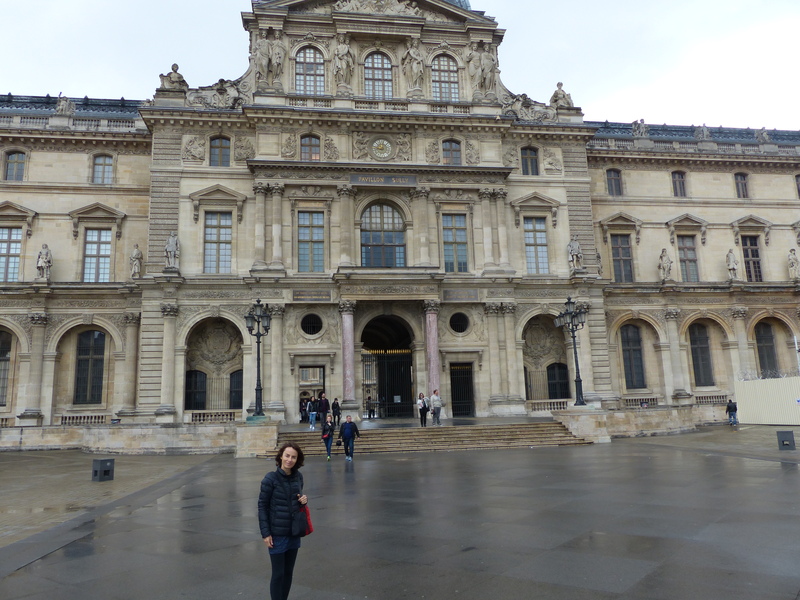 Anyway, no visit to the Louvre for us and no place of shelter from the grey and wet Parisienne skies. Oh well, we trotted off, into the now headwind (they find us everywhere it seems!) 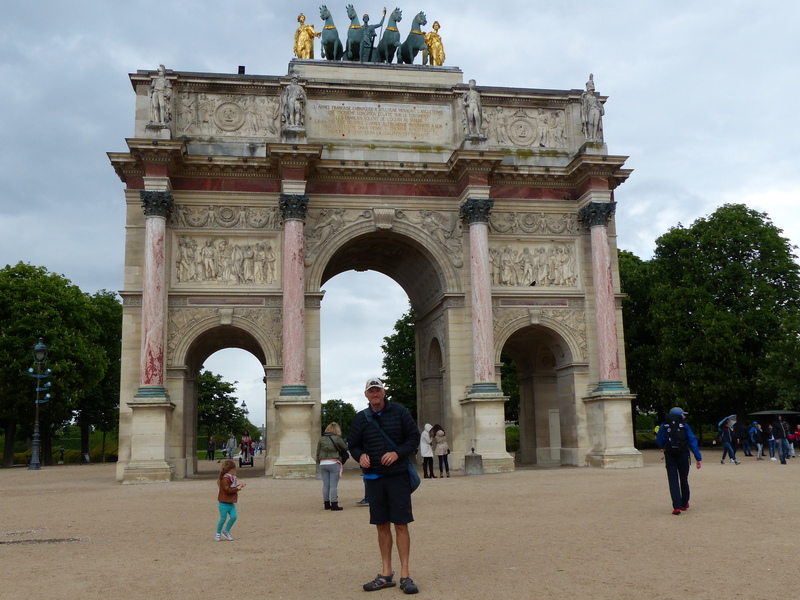 and began walking towards the Arc de Triomphe. We strolled up the Champs-Elysees, looking at all the fancy schmancy stores and fashion labels, with the sun beginning to win the battle against the black clouds. We talked about the Tour de France cyclists finishing the race down this famous stretch of road and we sauntered along with the grand arch in front of us. Knowing we have a few days in the city, we didn’t go up to the top of the Arc today, we’ll save that for another day when the weather may be a bit more favourable, so instead we walked all the way around and sat underneath and read all the plaques and just sat there saying to each other, “We’re in Paris and we’re sitting under the Arc de Triomphe! Guess what…?! We’re in Paris and we’re sitting underneath the Arc de Triomphe!” We just tried to take in the experience and the fact that we were there! We would never have thought we would be, and there we were! I’m looking forward to when we do go up to the top though, just for a better look at the mad traffic doing its crazy thing around the Arc. I’d heard about it and people who’d travelled here had told me about it and yes, it’s just as mad as they described! I have no idea how the drivers decide what to do, but they just fly through those multiple lanes going in all directions, some don’t even slow down, they just gun it and speed right through. 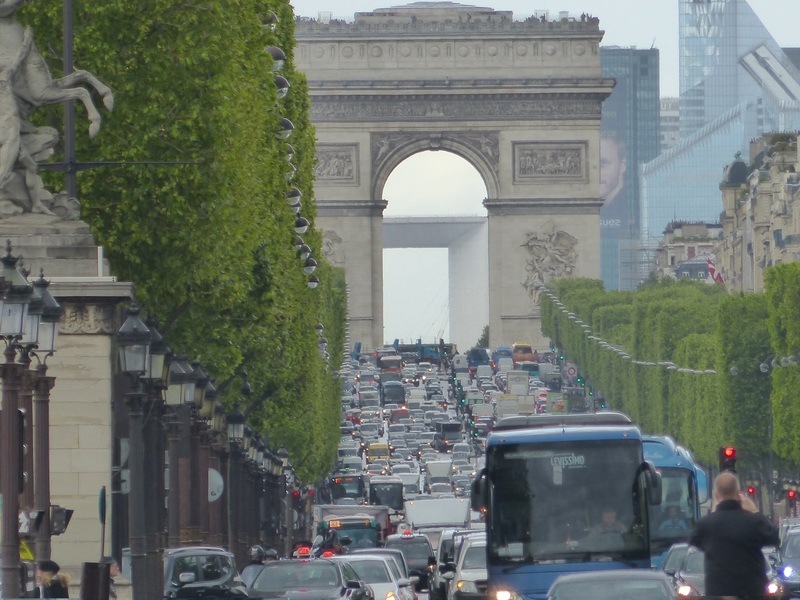 It’s the only place in Paris where, if there’s an accident, both drivers are held responsible and insurance companies automatically divide everything 50/50! We’re at the Arc de Triomphe! 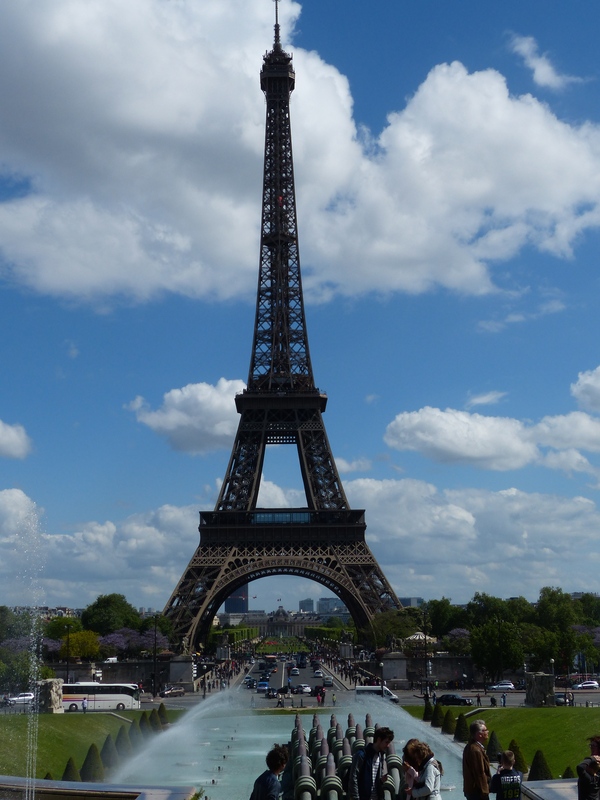 Well, our shoes were made for walking, so that’s just what we did and off we went to see the remainder of the grand structure, the top of which we had been viewing across the skyline all morning…off we headed towards the Eiffel Tower! We decided after a while to hop on the Metro, just to give us a bit more time and after a quick zip through the underground, we stepped out of the Metro darkness into bright sunshine and one of the first things we saw as we ascended the Metro steps was an Australian flag! 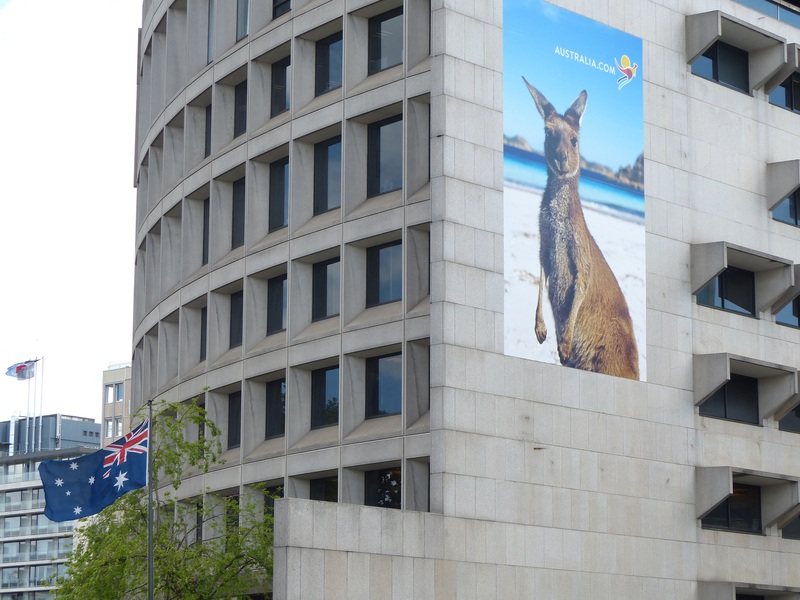 We had arrived at Promenade d’Australie! How appropriate! A short walk down our country’s stretch of tarmac and we were at the base of that famous, imposing, grand, beautiful, magnificent and breath taking structure, the Eiffel Tower itself. Some more of Steve’s creative photography! On we walked, just wandering now, not absolutely sure where we were heading, just walking and looking. 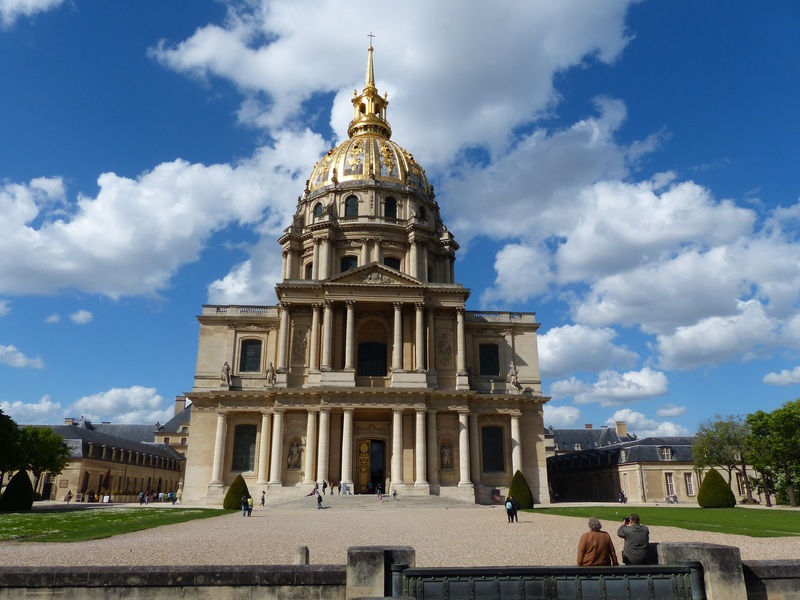 We ended up at the Hotel de Invalides and Eglise du Dome, with its beautiful domed roof that was apparently the inspiration for the design of the Capitol building in Washington DC. 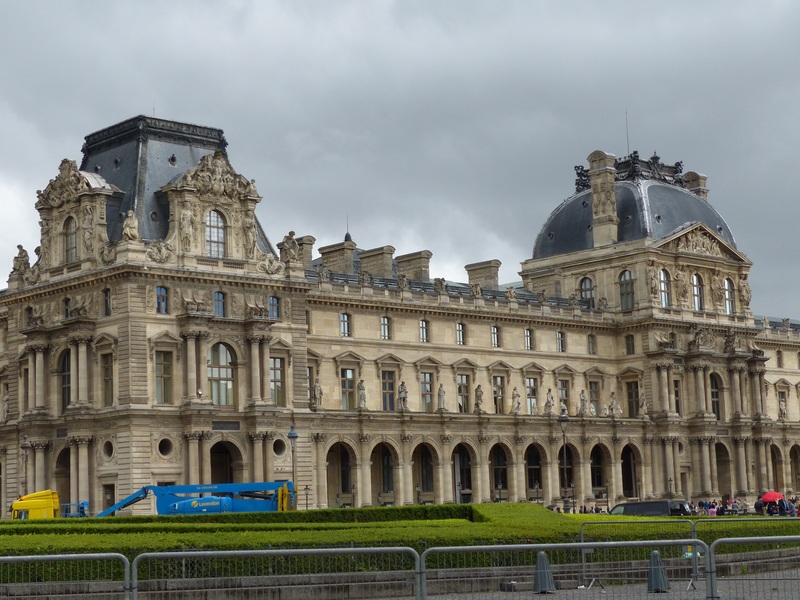 The Hotel de Invalides was built in 1671 by Louis XIV, as a place of rest and retirement for “crippled, old and retired officers.” The buildings and gardens were again…beautiful! 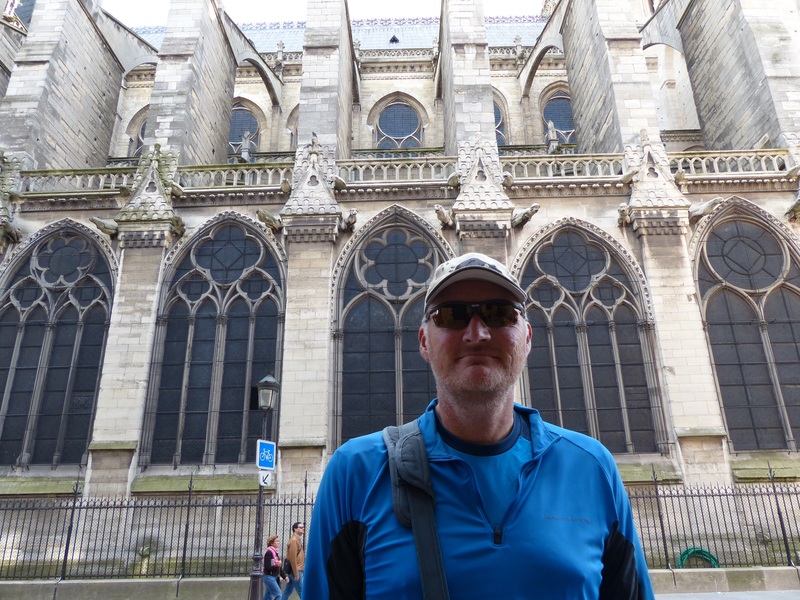 Next stop on our roaming route was Notre Dame. We again headed underground and took a couple of trains to this area and headed towards the grand cathedral. 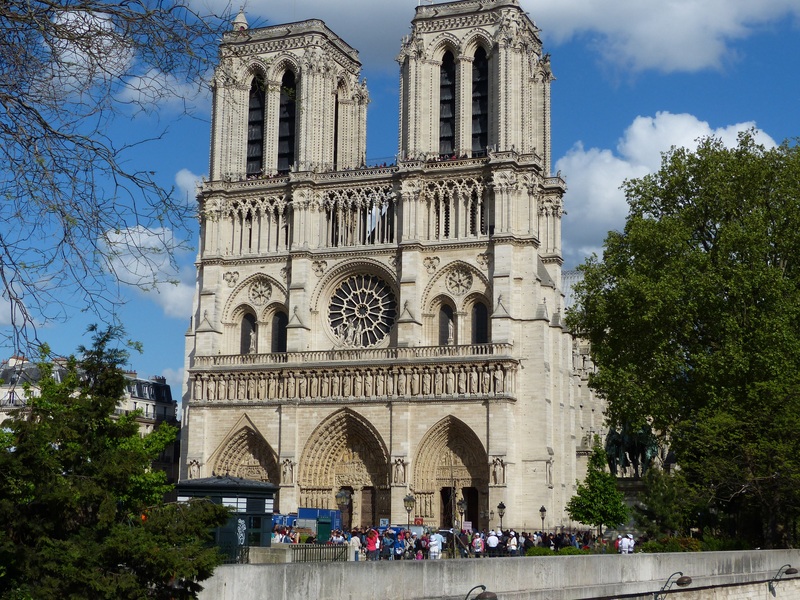 Our first comment on seeing it was, “Yep, it does look quite small!” because of Notre Dame Cathedral we had seen in Rouen that was described as being twice the size of the Paris version. 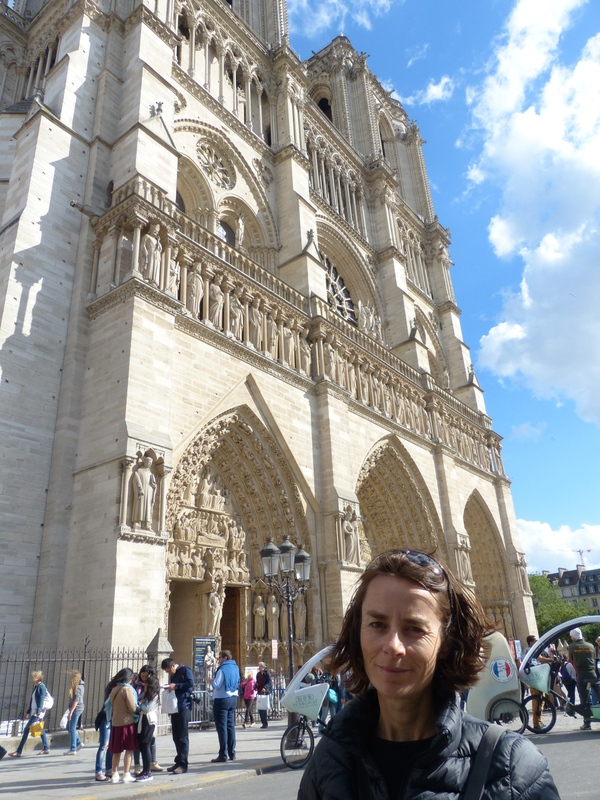 It was still an incredible gothic structure though and as we were there, the bells rang! “That’s Quasimodo!” I said to Steve, “the hunchback is ringing his bells for us!”. We’re at Notre Dame Cathedral! It was now after 6:00, so we decided to start making our way back towards our cabin at the campsite, so we walked some more to the metro, found the line we needed and took our trains back to the station on the outskirts of the city, where a bus would drop us at the door of our campground. What a day! What a simply amazing, incredible day! 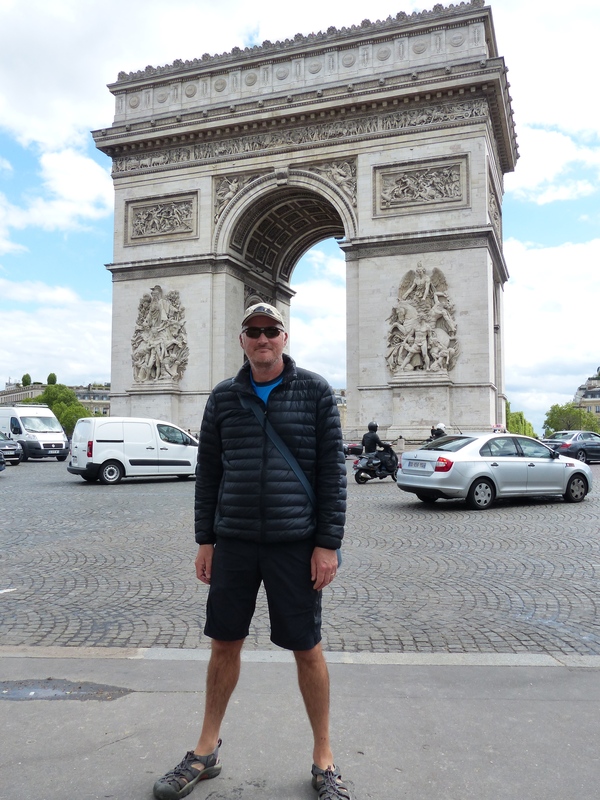 A day of walking, walking, walking all around Paris and being lucky enough to see this beautiful city and all its glorious sights, scenes, buildings, monuments and parks. It was fantabulisimo! Très bon! Très magnifique! Très formidable! Tomorrow will be more of the same. Dodgy weather or not, we’ll be out there, walking the streets of Paris, looking, experiencing, pinching ourselves, reminding ourselves of where we are and what we’re doing and just soaking up how special it all is. 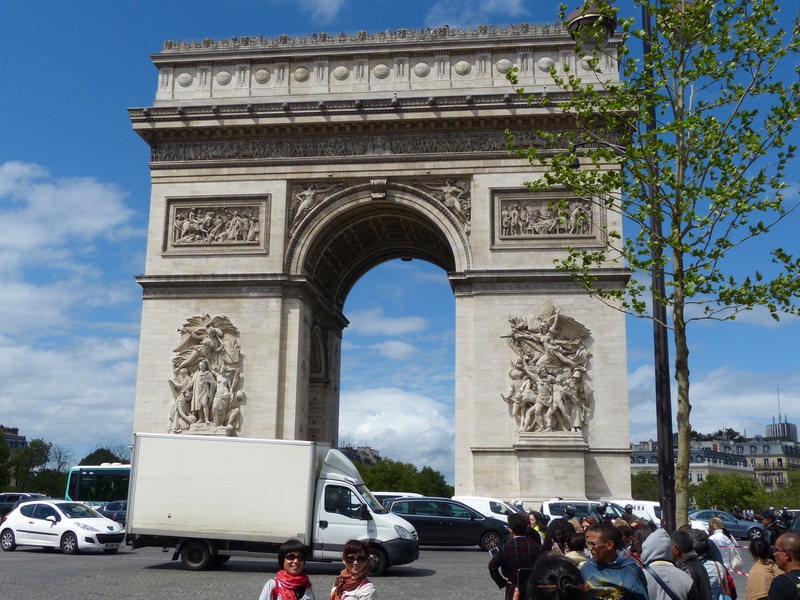 Because…we have pedalled our way to Paris! Buckle up grand city, Tassie has arrived! Heidi, when you go back to the Louvre go in through the ports de Lions and you won’t have to queue. Its like a little side door, a tiny bit more expensive but you go straight in, up the lift and you’re a hundred metres or so from the Mona Lisa herself! Shakespeare and co is just over the river from Notre Dame. I can just imagine Steve with all the pastries now!!! Oh you seasoned traveller you! You are a wealth of little tips and gems like this. Thank you! So good to know! Yay – photos with no sunglasses, much better 🙂 Go the “creative photographer”! Yep, I’ve made a conscious attempt to take them off because it had occurred to me that every photo includes shades!